I used to wear hats all the time in high school and college. I had a vast pool of hats that I could choose from, usually of the sports teams that I supported. My collection of hats now have dwindled to one. Most of the hats got lost in various places- movie theaters, planes, subway, beach. The last hat that I held onto for years was a Superman hat that is in the twilight of its life. It’s more than falling apart. It looks dirty and just raunchy, but I refuse to wash it. (It would wash away all the character the hat accrued during our tenure together). But I couldn’t ignore the fact that this hat needed to be retired and that I needed to go hunt for a new hat. I haven’t had to buy a new hat since, I don’t know, 5 years? So I went hat shopping, only to find that I couldn’t find any hat that spoke to me. And, when did hats become so expensive? Were they always that expensive and that I didn’t care when I was younger? And I’m very peculiar with my hats. One, I don’t like the adjustable hats, I need to get fitted or the flex fitted, one size fits all, type of hats. Second, the thing that really put a wrench in this hat search was the bill of the hat. When I was in school, the first thing we did when we bought baseball caps was to roll the hell out of the bill so that it’ll curve. And I mean roll the hell out of it. Some of my friends would roll it up, and put a rubberband around the rolled up bill and leave it over night. I remember constantly having to adjust the bill so that it’ll remain curvey. But today’s hats? The style is to wear it with a straight bill. And bill of the hats are flimsy and couldn’t handle the abuse that we would give it as teenagers. And frankly, I think I’d look ridiculous trying to rock a hat with straight bills with the label still on them. But here’s the thing. When I said that we pastors love change, that’s half true. We love implementing change. We’re not immune to hating change. We’re just as resistant to change. It’s human nature. We just don’t realize it, because we spend most of our time fighting to implement and bring change. I mean, for me the style of hats changed. I don’t like it. Sure, there are some that adapt easier to change, but that doesn’t necessarily mean that they like change. My point is, when we try to “change” the culture of our local church, it takes time, prayer and grace. In change, everyone loses something and they need time to mourn that change. Change is a form of loss. Even if change is necessary and required, nevertheless, it’s a form a change. We can’t just come into a church as its newest family member and say, “This is changing now!” and get rid of a sacred cow that, in the big picture, has no right or purpose of being there. Then be shocked and angry that so many people are resisting this absolutely necessary change. We need to bring people on this journey of change from the beginning. Yes, I know that God has placed in our hearts a vision for this ministry. But we have to remember that this vision is for the entire church, and not just us leaders. Fear comes with change. We can’t ignore that. The best of leaders aren’t the ones that forcefully drags people to the place where the leader already is standing. No, I think, the best of leaders start on that journey together with the people, from the beginning, standing in the front serving as a visionary and guide when she needs to be. Or standing in the back of the pack and being the encourager and giving them a graceful push when he needs to. Or walking side-by-side with the people. The leader doesn’t always have to stand in the front of the pack. We need to soothe the fears that come with change. Let them know what is changing, what isn’t changing, why it’s changing. And we owe them that because the vision that God has is for the entire congregation, and not just for the implementer. We also need to give them space to let the change sink in, to mourn the loss if you will. I can’t speak from personal experience. But this is what I’ve gathered from listening to stories of those who’ve gone before me, from books about vision and leadership, and from my time as a Lewis Fellows. I don’t know much, but what I do know is that change is difficult for everyone. And I hope that knowledge will help me be more empathetic when the time calls for me to be the implementer of change. In the mean time, I’ll always prefer my hats fitted and with a curved bill. 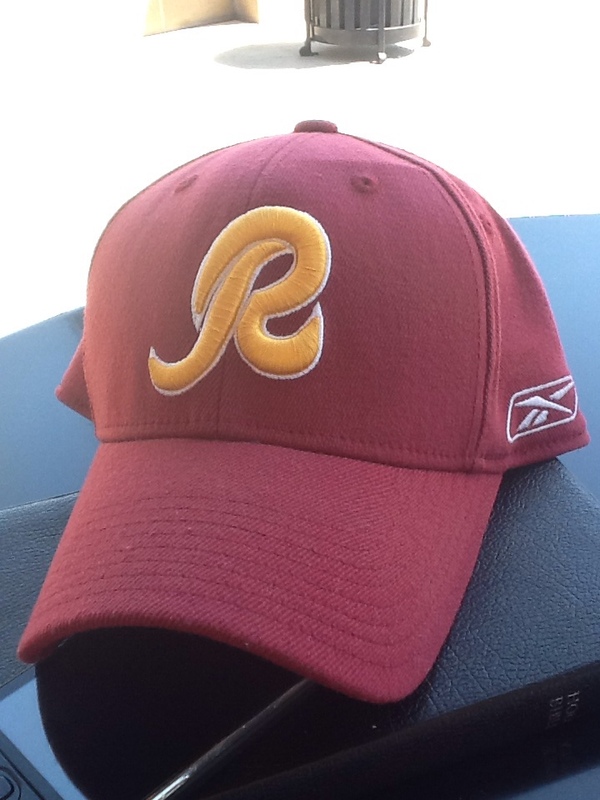 And, I’m less ashamed to rock my Redskins hat today, because we have a new hope in the form Robert Griffin the Third.